Stephen MacDonald’s Not About Heroes is a play about poetry. It is also a play about pity. It is, of course, a play about war. 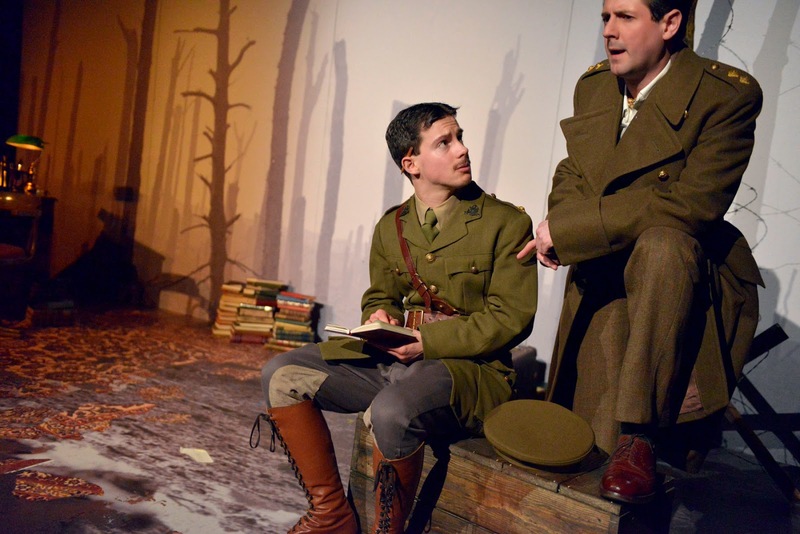 But above all, it is a play about the strong friendship between two men: Wilfred Owen and Siegfried Sassoon. In the Theatre by the Lake’s current production, directed by Jez Pike, Owen and Sassoon are thoughtfully portrayed, not only as the great poets we recognise today, but as people, with their own fears, hopes and doubts. Both cast members (Philip Labey as Wilfred Owen and Matt Addis as Siegfried Sassoon) portrayed this human aspect beautifully, and did a superb job of carrying the play. Their more humorous moments brought a vitality to what is essentially a very wordy play, while the inevitable tragic ending caused more than one set of tears in the audience. As Sassoon battled against his inner turmoil, Addis’ speech at times became almost uncomfortably loud in the intimate space of the Studio Theatre, leaving Labey’s Owen like a startled deer in the brazen headlights of the older poet. Labey’s timidity during the characters’ first meeting was something any writer or creative writing student will identify with, but it was incredibly moving to watch him grow in confidence into the man that Owen was destined never to fully become. This inevitable pathos is echoed by the simplicity of Martin Johns’ set. The backdrop of dead trees is an ever-present reminder of the war, while the carpet of Craiglockhart hospital on one side of the stage fragments into the blasted mud of the Front on the other. There were occasions where the play shifted into an overly stylised version of itself (the opening, for example), but fortunately these moments were few and fleeting, and quickly gave way to the real meat of the production: the intimacy between the two poets. ‘The poetry is in the pity,’ reads Owen from his Preface. In Jez Pike’s production, not only poetry and pity, but drama as well, are in the chemistry between the play’s two impressive actors. Adapting a well-loved childhood classic is always a risk, but in the case of Theatre by the Lake’s Christmas production of Arthur Ransome’s Swallows and Amazons, the risk pays off. Helen Edmundson’s script, directed by Stefan Escreet, brings the novel to life for a new generation, while not losing the magical and nostalgic feel of the book. For me, one of the most beautiful things about this production was that it reminded me what a play fundamentally is: play. And Theatre by the Lake’s Swallows and Amazons is all about playing. Designer Martin Johns’ revolving set comprises a huge pile of wardrobes, suitcases and chests of drawers, all of which became the island. The props were similarly created from everyday objects: a parrot from a feather duster; a baby from hot water bottles; birds from garden shears; the Swallow from an upturned table. This creation of the extraordinary from the everyday exercised my imagination, inviting me to play along with the characters. 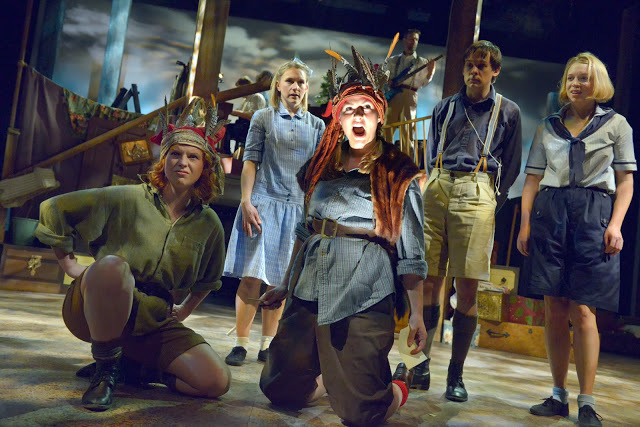 While Theatre by the Lake steers clear of pantomimes, Swallows and Amazons drew me in with a childlike conspiracy of believing, making me feel far more involved in the story than I could have done from just shouting ‘He’s behind you’. This sense of involvement is aided by the sense of space created by Andrew Lindsay’s superb lighting, and of course by the fabulously versatile actors, who not only play out the story’s various characters, but also sing and dance to Neil Hannon’s lively, catchy songs, and accompany on various musical instruments; I’m sure I wasn’t the only one surprised when only nine people took the curtain call at the end. All in all, I found Swallows and Amazons a fun and joyous evening out: a performance not just for children, but for the child in all of us.